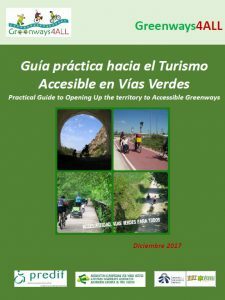 The new updated and completed practical guide covers general aspects of accessible tourism, best practices for greenways in Spain and Europe, and includes a section with recommendations for the design of greenways for everyone. The guide has been produced by PREDIF and FFE, with the cooperation of the European Greenways Association. It covers general aspects of accessible tourism, best practices for greenways in Spain and Europe, and includes a section with recommendations for the design of greenways for everyone. It also includes the methodology of the Greenways4ALL project and some very interesting and practical annexes.